The digital landscape is constantly evolving. To remain relevant, businesses and marketers need to constantly pay attention. What’s hot today could be gone tomorrow, and tomorrow’s big thing may not even exist yet. 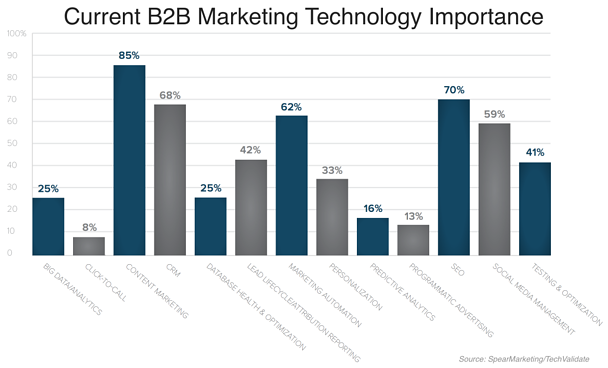 In an effort to understand how B2B businesses are utilizing digital technologies and tactics, Spear Marketing Group and TechValidate conducted a survey of U.S. B2B marketing professionals. The data from this report provides actionable insights to B2Bs on how and where marketing budgets should be utilized. The following is a summary of the top digital technologies and tactics implemented by US B2Bs, ranked based on effectiveness, relevance, and ROI. 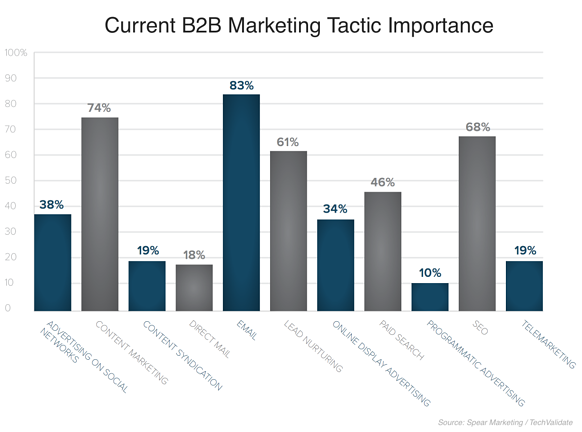 B2Bs are turning to content marketing more than any other digital marketing technology. Furthermore, more than half of B2Bs think content marketing will be the most significant digital tactic in the next 12-18 months. More than nine out of ten B2Bs are investing in content marketing for the purpose of generating leads. CRM and marketing automation technologies then allow marketers to track content marketing activities to leads, and ultimately revenue. To execute a content marketing program, B2Bs turn primarily to blogging, whitepapers, and webinars. Blogging is being utilized to drive new visitors to a website, while whitepaper and webinar signups allow businesses to grow their prospect database. Whitepapers and webinars are also considered excellent methods for establishing authority and credibility. But quality content doesn’t come easy, as any business who has attempted content marketing can attest. Nearly half believe creating meaningful content is a challenge. In our experience as a digital agency, the most likely causes of failed content marketing is lack of investment and strategic approach. Nearly three out of four B2Bs believe SEO is an important part of executing their digital marketing strategy, second only to content marketing. While SEO has changed considerably over the years, it’s just as important today as it was in the past. What has changed are the methods used to achieve top rankings in search engines. Put simply, SEO has become much less a technical challenge and more so a content challenge. Tweaking meta code on a website is still important, as are building links. But those tactics alone are not enough. Social media, blogging, and building online influence are now equally critical components. And unlike the early 2000’s, the components most critical for successful SEO can’t be farmed out cheaply overseas. 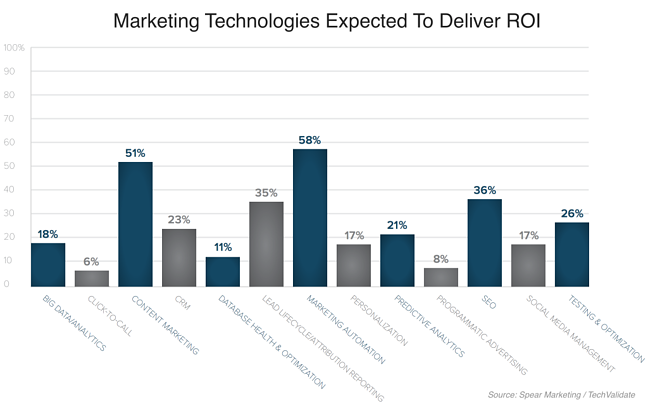 Marketing automation is considered the digital marketing technology most likely to deliver significant, measurable ROI. Given the typical marketing automation software investment exceeds $10,000/year, being able to demonstrate ROI is critical, especially for SMBs. Marketing automation technologies such as Hubspot, Marketo, and Pardot bring greater organization and ROI to digital marketing activities. 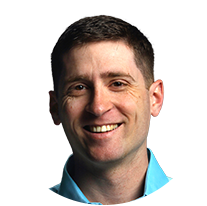 They allow companies to tie digital investments back to the leads they generate, trigger automated communications to prospects, and alert sales personnel when a prospect is in the buying mode. This technology used to only be available to large corporations with large budgets, but it is now affordable to businesses of almost any size. Click-to-Call, Programmatic Advertising, and Predictive Analytics are considered least essential to the success of their organizations’ marketing programs. Programmatic advertising and predictive analytics (both considered a step in the “artificial intelligence” direction) have been considered potential game-changers in the marketing space; however, the technology isn’t nearly as developed or affordable as the more established technologies. That being said, many marketers see the importance of predictive analytics increasing over the next year, just not necessarily within their own company. Email is considered the most important digital marketing tactic today; ahead of content marketing, SEO, and lead nurturing. Lack of budget is considered the largest single challenge. For marketers struggling for budget, being able to demonstrate ROI is critical. Marketing automation, while expensive, can best demonstrate an ROI. Marketers and business owners should focus their time and money accordingly. While video landed below blogs, whitepapers, and webinars in terms of importance, it is projected to be the most important content type in the future. Lead nurturing is a core component of any marketing automation software, and is projected to become one of the most important digital marketing tactics in the future. If you’re not yet taking content marketing and marketing automation seriously, you’re already behind the curve. Companies will continue to differentiate through content, while using marketing automation and CRM to tie all activities through to sale. Artificial intelligence tools are on the horizon, but not yet practical for the non-elite. This could easily change in only a few short years, as has been the case with marketing automation and CRM. Hat tip to Spear Marketing for the great report. You can read the full report here.